The last several years have seen a transformation of the 117-year-old Swarovski brand. While still primarily associated with crystal, the firm is now primarily perceived as a youthful women’s fashion brand. But while the products and retail outlets blazed a new trail, the company’s previous UK headquarters had found itself left behind. “Our previous office left us facing two challenges: the first was the location, which was far from the important London market; the second was the statement we wanted to make and how we represented our brand,” says Hayley Quinn, Managing Director, Swarovski. Swarovski’s brief for their new workplace therefore emphasised flow, flexibility and the contemporary femininity of the Swarovski brand. “We wanted it to be on one floor, and we wanted a natural movement of people and information around the office. It was all about collaboration and openness and information sharing. We wanted it to be an environment that people would identify with and want to be in,” Quinn explains. Detail requirements for the new office included provision for a staff of up to 135, a boardroom, executive offices, small meeting rooms, a staff café/pantry, and a ‘mock shop’ environment. 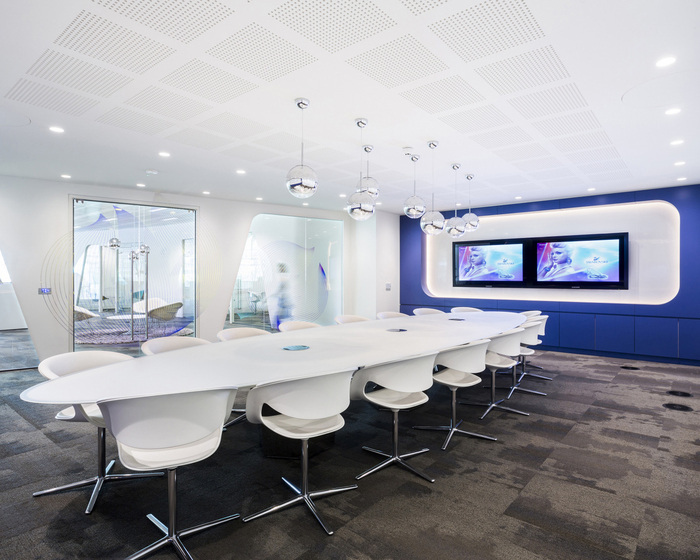 To bring the office to a more brand-relevant location, M Moser collaborated with Swarovski in selecting a new space in the Richard Rogers-designed Chiswick Park business estate. Besides its proximity to central London, the site was viewed as ideal due to its contemporary architecture, and its sustainable infrastructure and amenities. The finished office occupies one-half of a floor plate, wrapping partly around the building’s service core and atrium. The reception area is both open and visible from outside through the atrium’s glass walls, its boundaries loosely demarcated by two curvaceous, enclosed ‘islands’ accommodating a luggage/cloakroom and a pantry. As well as preserving the office’s openness and flow, the islands serve to express the femininity of the Swarovski brand. As a byproduct of their respective sizes, alignments and precise locations, both the eye and the body are led through the space intuitively. Three larger ‘islands’ within the floorplan – respectively containing a staff café, executive offices, and a ‘mock shop’ – exert a similar effect in the working areas. In keeping with the delicacy and lightness of the architecture, the designers specified a desking system combining a high degree of functional flexibility with minimalist lines. A notable feature of the bench-style desks are their curved elements – including tops with chamfered edges – which echo the voluptuous forms of the office architecture. The staff café continues the workplace’s theme of encouraging staff interaction. Rather than segregating themselves at individual tables, users from all teams and departments sit or stand together at high benches. This arrangement also lends itself to the space being used for informal meetings and discussions, social functions and events. One aspect of particular interest in this design was the attention paid to the view from the outside in – an approach taken primarily to give the space an external brand identity while still complying with Chiswick Park’s prohibition on tenant signage. As the building’s glass-walled atrium makes the reception area a particular focal point when viewed from outside, this area was designed with such eye-catching, brand-expressive features as a ‘crystal wave’ chandelier. The design team also ensured that few if any built portions of the design were located against the space’s transparent external walls. Colour also plays an important role in how the design forms a strong ‘feel’ for the brand. While predominantly white, the palette is enlivened with dashes of purple-blue and pink via selected furniture pieces and rugs. A graphic film applied to the curved wall sections adds yet another hint of colour akin to the prismatic effect of a crystal. According to Quinn, the net effect of Swarovski’s open-yet-curvaceous new office has been dramatic: “It made an instant difference, literally as soon as we walked in on the first day. All our employees now understand who we are and where we’re going, and it’s become a great place to work.